Low Carb Keto Buttery Crackle Chicken Thighs are the most delicious, juicy, and super crunchy-crackly chicken thighs you’ll ever make! 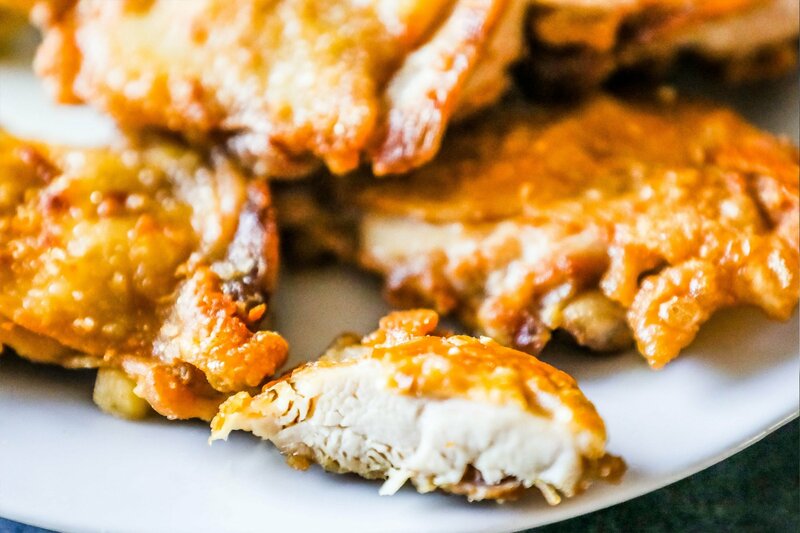 These keto fried chicken thighs taste rich and breaded – with almost no carbs and no flour, gluten, or grains! There is nothing better than crispy, crunchy, crackly fried chicken – it is just heaven on a plate. The only problem with frying chicken at home is it can be such a pain – and I am a fan of simple, un-fussy recipes that don’t require a ton of prep. 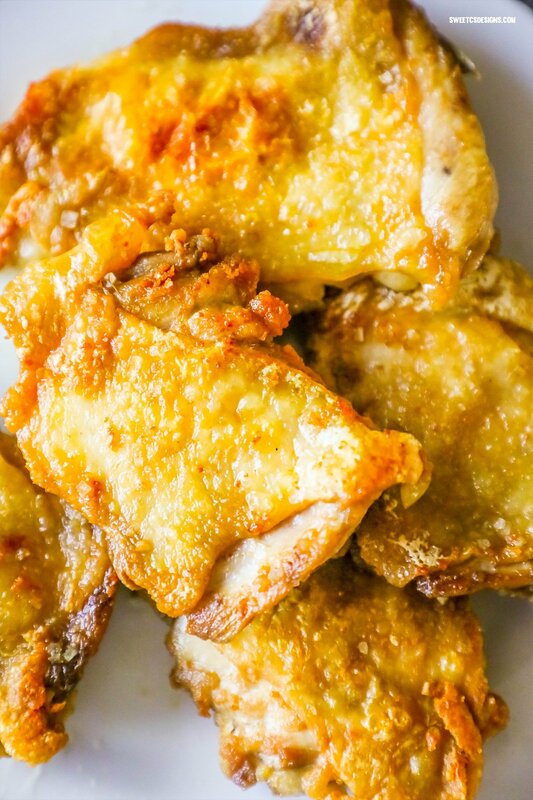 This chicken is delicious, crunchy, and so easy – with only a few ingredients! 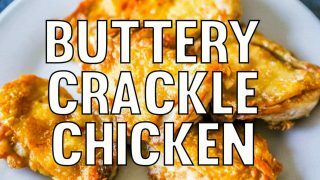 It tastes just like battered fried chicken thanks to some incredibly crispy skin, and full of buttery flavor. This chicken is so delicious even my kids who normally don’t love chicken thighs gobbled it up in seconds! Since we’re using chicken thighs, there’s less risk of drying the chicken out… but this method results in perfect, juicy chicken every time. I mean, look how incredibly delicious it looks inside! Make sure you buy chicken thighs with skin-on – but if you find some de-boned you can always buy that and skip cutting out the bones. I always buy bone-in simply because they are so inexpensive! 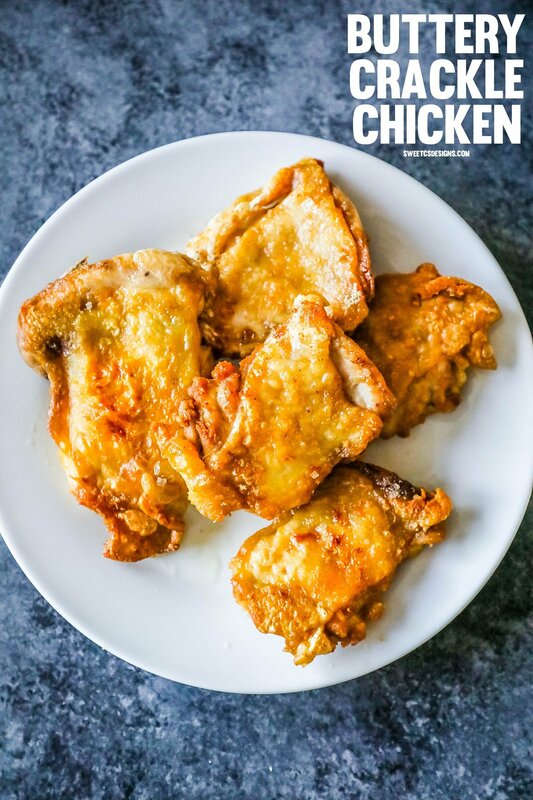 While this easy fried keto chicken recipe is super simple and requires very few tools, there are a couple of things that will help you make the most delicious, juicy, crunchy, keto fried chicken ever! These picks from my Amazon Affiliate links are items I use and are tried and true kitchen favorites. 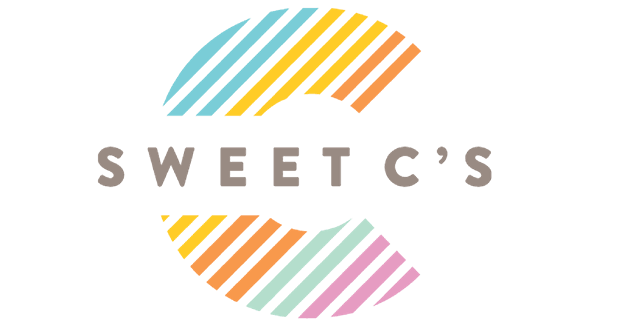 While I receive a small commission when you purchase through my links, it helps to offset costs of running Sweet C’s at absolutely no extra cost to you! Since we’re frying chicken in hot, bubbling butter it is imperative to have a pan with a decent lip on the edges so butter doesn’t splash all over, which is not only dangerous for you and your hands – but can start a kitchen fire. You can also cook this in a dutch oven if you want extra tall pan walls to prevent oil or butter splashing. Flipping chicken in bubbling hot butter can result in burns – so I try to use long handled tongs for this recipe so my hands are a ways from the hot bubbling butter in case some splashes. While this isn’t necessary at all, a splatter guard is a major timesaver (and safety precaution) anytime you’re cooking with lots of hot oil or butter. I personally love frying with them! Since chicken thighs are usually a lot less expensive than chicken breasts, it’s also an economical choice that is great for families. This recipe is an awesome base for other delicious keto foods – try some of my favorite ideas below! Cut Crackle Fried Chicken into strips and lay over a salad bursting with fresh vegetables and cheese for a keto fried chicken taco salad! Layer chopped chicken strips, vegetables, cheese, and cauliflower rice over cloud bread for a tasty keto chicken wrap! Fried Chicken with cauliflower rice and grilled vegetables on the side. Lemon pepper seasonings are so delicious with fried chicken- season yours with a lemon pepper seasoning blend for a delicious twist on this classic! Seasoning chicken thighs with taco seasonings is a delicious way to make a south of the border fried favorite! Fried chicken with blackening spices is another level delicious – sprinkle generously over chicken before you cook! Add red curry powder, salt, pepper, and a dash of onion powder for a delicious curry take on fried chicken thighs! Just be sure to season the MEAT side and not the fat side – or the seasonings can burn . 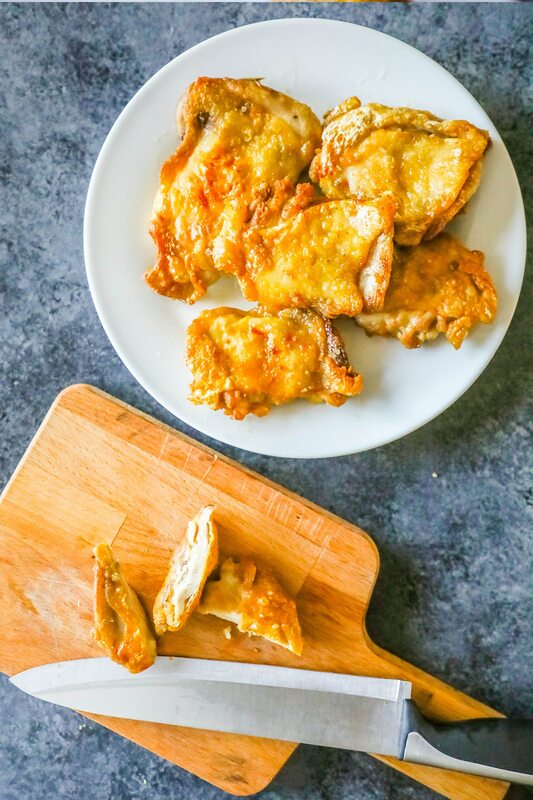 If you love this Low Carb Keto Buttery Crackle Chicken Thighs Recipe as much as I do, please write a five star review in the comment section below (or on Pinterest with the “tried it” button – you can now add pictures into reviews, too! ), and be sure to help me share on facebook! 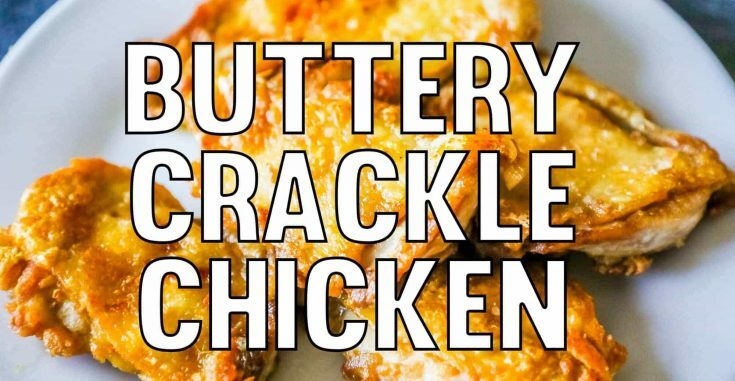 Buttery Crackle Chicken Thighs are the most delicious, juicy, and super crunchy-crackly chicken thighs you'll ever make! Lay chicken thighs out on a cutting board, and using sharp kitchen scissors, cut out bone from thigh. Pound chicken flat and make sure they are very dry, pat with paper towel if needed. Generously salt and pepper meat side of chicken (don't salt fat side, as it can easily burn). Heat a cast iron (or heavy) pan on high heat, so it is scorching hot (but not smoking). Add ghee/butter to pan, and let melt. Add chicken to pan, starting with the fat side down. Let fat crisp and chicken brown, about 7 minutes. Flip chicken and cook until 165 degrees internal temp - about 6 minutes. Let rest 2-5 minutes and pat off any excess butter softly with a paper towel. If desired, cut chicken into strips. Made this with bone in chicken thighs and did not remove the bone. It was still amazing and my family loved it. Will definately make again and maybe next time, remove the bone. This was excellent! I made it exactly as written and it came out perfectly. I love boneless skin on chicken thighs. They are a perfect keto dish. This is the best chicken ever!! I make it all the time now. This is really good! I’ve made it twice! Instead of removing the bone wouldn’t it be easier just to but boneless thighs? Jennifer- it definitely is, but I wanted to show that it’s also possible to cut it out quickly since you can’t always find boneless and its often much less expensive. This was an awesome recipe!!!! Thanks so much! A real Game changer:) great video too!! Oh my gosh Megan I’m so glad you liked it! It is one of our all time favorite ways to make chicken. Can you use butter or ghee? Norika – you can! I LOVE the flavor ghee gives chicken and since it has less milkfats, it has a higher smokepoint than butter. Why do you have to remove the bone? So removing the bone is definitely optional, but in this recipe I am trying to mimic the crunch and flavor of flour-dredged fried chicken without adding anything to the chicken – and removing the bones helps the chicken lay flat so more of the chicken can fry evenly, giving you more surface area for a “crunch”. But again – it’s pretty optional, and the chicken will still taste amazing with the bones in, it just might not be quite as crunchy since the chicken thigh will be rolled up and will take just a bit longer to cook.